CHALLEGE: I have often been asked to create cards for “encouragement.” That could mean a lot of things. Did someone lose a job? Is someone feeling blue? Is someone undergoing a health crisis? Just exactly what does a card for “encouragement” mean? What life event does the card need to cover? 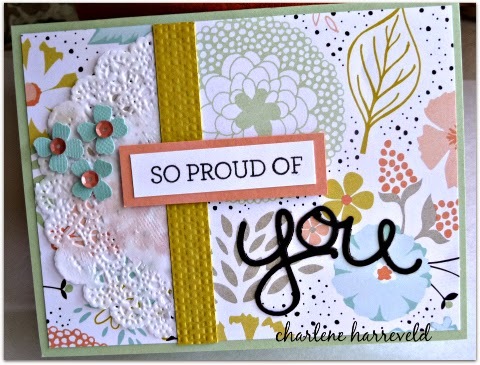 SOLUTION: I decided to use the “Proud Of” stamp from the Crazy About You Stamp Set (available in the current 2015 Occasions Catalog) and pair it with the “You” from the Hello You Thinlits Dies (currently unavailable to order until April 8th.) There are many reasons to be proud of someone: their accomplishments, their courage, their graduation. The sentiments in the Crazy About You Stamp Set can be combined with the words from the Hello You Thinlits Dies to make numerous combinations of greetings for your cards. Both items make great additions to your stamping collection. If you are having trouble adhering the words because of how thin they are, click HERE for the tutorial on how to use Stampin’ Up!’s Multipurpose Liquid Glue. Also, the designer series paper I used to make this card is from the Sweet Sorbet Designer Series Paper, which is no longer available. But don’t fret! I suggest using the current Lullaby Designer Series Paper. It has similar color schemes to the paper I used. Share the cards and projects you have made using the Crazy About You Stamp Set and the Hello You Thinlits Dies! Just link to your project in the comments below.